Home News Community Join the Roaring Chorus for peace! Join the Roaring Chorus for peace! Rev. 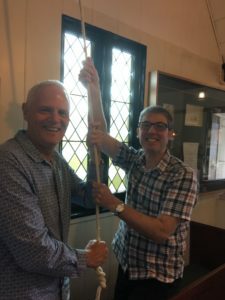 Andrew Coyle and Scott Malcolm ringing the bell of the Selwyn Church. This Sunday at 11.02am, All Saints Anglican Church will be ringing the bell of the historic Selwyn Church after two minutes of silence to commemorate the 100th anniversary of the signing of the Armistice that ended World War I.
Andrew Coyle, vicar of All Saints, said, “Our kids enjoy joining in music on a Sunday with drums, tambourines, and shakers, so we are going to give them an opportunity to really let rip! Peace, wherever and whenever it happens, is something we want to celebrate so we would like to invite anyone who would like to bring an instrument or noise-maker to come and be a part of this”. All Saints will be remembering those who have died in war and praying for peace at their 7.30am and 9.30am services this Sunday. The Selwyn Church on the corner of Selwyn Road and Cook Street is the oldest building in Manukau.